CIDER TOWER, chr., 2- 304s.s. fau/ shk./ t.p. - F.H. Steinbart Co.
Home / Towers / CIDER TOWER, chr., 2- 304s.s. fau/ shk./ t.p. CIDER TOWER, chr., 2- 304s.s. fau/ shk./ t.p. 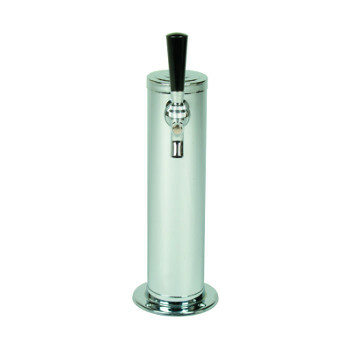 This double faucet tower features two 304 stainless steel faucets, shanks and tail pieces ideal for dispensing cider, kombucha as well as beer. Complete with 5 feet of 3/16″ clear vinyl beer tubing per line, gasket, mounting screws and hex nuts for connecting to standard couplers. CIDER TOWER, chr., 1-. 304.s.s. fau/shk/ t.p. CIDER TOWER, chr., 3- 304s.s. fau/ shk./ t.p.